For Freshman Orientation or Critical Thinking courses as well as a supplementary text for use in any subject-matter at any educational level. This concise, effective guide is designed to help students learn to think critically in any subject-matter. Learning to Think Things Through presents a combination of instruction and exercises that shows the reader how to become active learners rather than passive recipients of information, use critical thinking to more fully appreciate the power of the discipline they are studying, to see its connections to other fields and to their day-to-day lives, and to maintain an overview of the field so they can see the parts in terms of the whole. 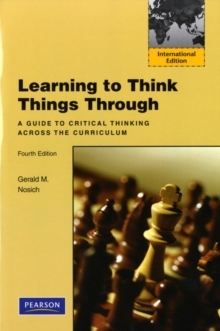 The model of critical thinking (used throughout the book) is in terms of the elements of reasoning, standards, and critical thinking processes. This model is well-suited to thinking through any problem or question.